Designed to start-up and shutdown a PC dependent on another power source. What is the Computer Start-up and Shutdown Controller? 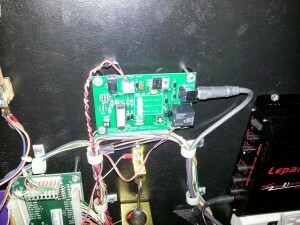 The Computer Start-up / Shutdown Controller (CSSC) was designed to help control custom computers in Arcade Machines, Pinball Machines, and automotive applications. Today, there are a number of DIY projects where computers are used with no easy way to control them safely powering up and down. This is where the CSSC comes in. The CSSC will monitor an external (machine) DC power source and power up or shut down a computer based on the state of this external supply. It does this by monitoring both the machine power supply and the computer state, via USB. If the machine power is turned on, the CSSC will trigger the power switch of the computer and wait for it to become active via USB. Once the power for the machine is turned off, the CSSC will trigger the power switch once again to shut down the computer. There are also a significant amount of logic in the CSSC to ensure the computer is in the proper state. There are only 3 things that need to be plugged into the CSSC in order for it to operate properly. The Machine Power Input is located at the top left side of the CSSC. This connection has 2 options, a DC power hookup with a 2.1mm (center positive) DC jack and 2 screw terminals. The machine input power can be hooked up to any DC voltage between 5vdc and 12vdc. 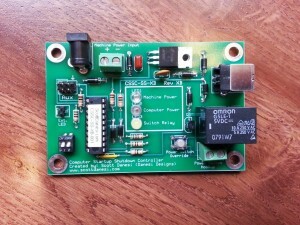 We have tested the CSSC on unregulated 12v circuits that bounce to 14vdc with no issues at all. It is recommended not to exceed this value because you may cause damage to the CSSC’s internal voltage regulator. This power supply should switch on and off with the power switch of the Arcade/Pinball machine or be hooked up to an ignition source in automotive applications. The USB connector is located on the right top side of the CSSC and uses a standard USB A to USB B cable. This connection is only used for monitoring the USB power from the computer and requires no software to be installed on the computer. The Computer Power Switch connection is located on the bottom right of the CSSC. This screw terminal connection must be connected to the power button switch of the computer. There is usually a jumper on the motherboard you can use for this, or you may have to connect wires to the existing power switch on the computer. The CSSC will momentarily “click” the switch using this connection. After those 3 things are hooked up correctly, the CSSC will manage the PC power state for you. Below is a demo video of the CSSC in my Bride of Pinbot Pinball Machine. The PC must be on a constant power supply to enable it to run even after your machine is powered off. This board has gone through many revisions and has been tested thoroughly, but please be aware that you are using this at your own risk. I am not personally responsible for any damage to the CSSC or your property if you use this. You must use a 6vdc to 12vdc power input only. If you use anything above 12vdc, you may damage your CSSC. The CSSC will NOT do a hard shutdown on your PC, which will allow for OS updates and anything else the PC needs to take care of during startup or shutdown. My USB is always powered up, what now? This is a very common issue with some small PCs and will cause the CSSC to think it is not powering up and down the computer properly. There is usually a setting that you have to enable in the Bios of the PC called “EuP”. Enabling this will disable the constant power output to USB devices and should restore the functionality of the CSSC. Is there software that needs to run on the PC to communicate with the CSSC? There is no software that gets installed on the computer. It only reads the power from the USB to detect whether the computer is on or not. This will work on all computers with USB and a power button switch regardless of Operating System. Does the CSSC work with any machine power supply? You can use any machine power supply as long as it does not exceed (too much) 12vdc. It also works with unregulated 12vdc sources as the CSSC contains a voltage regulator. The price of the CSSC will be $54.95 usd plus shipping. Please contact us here for wholesale pricing.